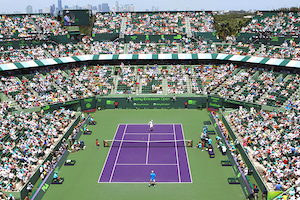 The men’s singles draw at the Sony Open Tennis event is befitting March Madness, with plenty of surprise entrants making impressive inroads, but Novak Djokovic is doing his best to restore order in the absences of Roger Federer and Rafael Nadal. Two days after destroying Lukas Rosol 6-1, 6-0 in his opening match, Djokovic rolled over Somdev Devvarman 6-2, 6-4 during second-round action on Sunday afternoon. Miami’s two-time defending champion took control right away with a break for a 1-0 advantage in the first set. Djokovic broke again for 5-2 and served out the opener one game later before a single break helped him through the second. Devvarman saw his only break chance in the final game at 5-4 in the second, but he could not convert. David Ferrer also handled the conditions in commendable fashion as he dismissed Fabio Fognini 6-1, 7-5. Ferrer, who was contesting his first match of the tournament due to a Dmitry Tursunov withdrawal in the previous round, gave back a break in the second set but recovered to served out the match at 6-5. 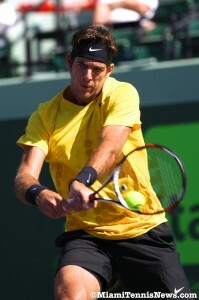 More dramatic encounters featured Jurgen Melzer against Tobias Kamke and Albert Ramos against James Blake. Kamke had taken out Juan Martin Del Potro and he got off to a fast start in this one, but Melzer stormed back to prevail 6-7(3), 6-3, 6-4. Ramos survived a hard-hitting night match in the Stadium, scoring a 6-4, 2-6, 7-5 victory over Blake. They aren’t quite making Cinderella runs of Florida Gulf Coast proportions, but either Melzer or Ramos will advance to the quarterfinals when they go head-to-head on Tuesday. This weekend, the world group playoffs sorted out which eight nations would be eligible to compete against the seeded teams for the coveted Davis cup in 2010. Team Switzerland, headed by world number one Roger Federer, defeated Italy while France’s workhorse turned out to be Jo-Wilfried Tsonga. 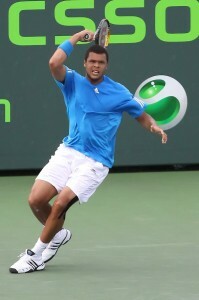 Battling the Netherlands, Tsonga was instrumental in three out of four victories. Besides Federer, the Swiss had top 30 singles player Stanislas Wawrinka to rely on. As a packed Italian house looked on Friday, Wawrinka defeated Andreas Seppi 6-4, 6-1, 6-2 in the initial rubber. Later, Federer took care of Simone Bolelli 6-3, 6-4, 6-1. With its top singles players sitting out the doubles Saturday, Switzerland had its lead narrowed by Italy’s win. However on Sunday, unfazed by a rain delay, Federer beat Potito Starace 6-3, 6-0, 6-4 to secure his country’s crack at the cup next year. In the Netherlands, after countryman Gael Monfils lost the opening match against Thiemo De Bakker; Tsonga prevailed 7-6, 6-2, 7-6 over Jesse Huta Galung to level the contest. Then, Saturday, Tsonga joined forces with Michael Llodra to eclipse team Netherlands 6-3, 3-6, 7-6, 6-4. Sunday, Tsonga avenged Monfils’ failure with a 7-6, 6-2, 3-6, 7-6 win over De Bakker. Although that victory was enough to seal France’s spot in the world group, Jeremy Chardy capped the day by carrying the last rubber. Serbia playing at home against Uzbekistan had more than enough fire power despite the absence of Novak Djokovic. With only one singles player in the top 100, Uzbekistan tried its best, but had no answer to the combo of Viktor Troicki, Janko Tipsarevic, Nenad Zimonjic and Ilia Bozoljac. Serbia won all five matches. On Friday, India taking on South Africa in the latter’s backyard build a 2-0 lead courtesy of victories by Smoved Devvarman and Rohan Bopanna. Subsequently, Saturday, Jeff Coetzee and Wesley Moodie got South Africa on the board by carrying the doubles. Yet, Sunday, after Rik De Voest went ahead two sets to zero, Devvarman stormed back taking the next three sets to maintain India’s world group status. After Andreas Vinciguerra down 6-7, 6-7 had to retire against Romanian Victor Hanescu, the Swedish crowd was uplifted as Robin Soderling defeated Victor Crivoi 6-2, 6-1, 7-5 to put that nation on level footing. The following day, Soderling paired with Robert Lindstedt to beat Horia Tecau and Hanescu 6-1, 7-6, 7-6. The following afternoon in the all important fourth match, Soderling crushed Hanescu 7-5, 6-1, 6-0 to prevent Sweden, a perennial fixture in the world group, from being relegated. Shortly after the euphoria of Marcos Daniel’s win over Ecuadorian Giovanni Lapentti, the Brazilian crowd was brought back to earth as brother Nicolas Lapentti defeated Thomaz Bellucci 7-6, 6-4, 7-5. On Saturday the Lapentti siblings inflicted further misery by prevailing in five sets match over Marcelo Melo and Andre Sa. With Ecuador leading 2-1, in Sunday’s reverse rubber, Daniel down two sets to none, pushed Nicolas Lapentti to a fifth set. Yet, the hometown crowd was brought to despair as Lapentti carried the match 6-4,6-4,1-6,2-6,8-6 thereby eliminating Brazil from the world group. The most compelling group matches were Belgium vs. Ukraine and Chile vs. Austria with both requiring a decisive fifth rubber. After Belgium’s Christophe Rochus and Steve Darcis gave their side a 2-0 advantage on Friday, Saturday in doubles, Sergei Bubka and Sergiy Stakhovsky defeated Xavier Malisse and Oliver Rochus 7-6, 3-6, 6-4, 7-6 to keep Ukraine in the game. Furthermore, on Sunday, Stakhovsky denied Malisse by claiming the fourth rubber 6-3, 3-6, 0-6, 6-1, 6-3. But, Belgium’s setback was temporary. In the fifth rubber, Darcis strong armed Bubka 6-2, 6-1, 6-0. A continent away, Chile found itself in the same position as Belgium. After Nicolas Massu and Paul Capdeville won their matches on Friday. Austrians Julian Knowle and Jurgen Melzer kept their nation in the fold by beating Massu and Capdeville in doubles. Moreover, the Chilean crowd had its anxiety heighten as Melzer won the fourth rubber 7-6, 4-6, 6-2, 5-7,6-4 over Capdeville. However, later that day, Massu defeated Stefan Koubek 6-4,4-6,6-4,7-6 to grab the ultimate world group spot. The victors will square off next year against Spain, the Czech Republic, the U.S., Russia, Argentina, Croatia, Israel and Germany, the top eight seeds in that order. The placement for the world group playoff winners will be released Wednesday. With the encouragement of hundreds of delirious supporters, Indian wildcard Somdev Devvarman took on Croatian Marin Cilic in the finals of the Chennai Open. Somdev, a 23 year-old former NCAA champion ranked 202, proved quite a handful for the younger number 3 seed. Nevertheless, Cilic cooled off his opponent to prevail in straight sets 6-4, 7-6. Ripping a forehand crosscourt for winner, Cilic finished an unadventurous game to open the match. Conversely, with a backhand crosscourt error, Somdev faced his first break point. However, with steeliness in the long rallies and deep penetrating groundstrokes, Devvarman conquered the wave. Then, Somdev turned the tables on Marin, connecting on a forehand pass and backhand up the line winners for triple break point. With his overpowering serve, the Croatian bullied his way out of trouble for 3-2. But, Cilic went down again double break point in his next service game when Devvarman thrusted one of his rocket like serves back to force an error from him. Yet, with crosscourt winners on the forehand and backhand, Marin once more pulled out the game for 4-3. With Devvarman serving at 4-5, the Indian picked the most inauspicious moment to bring out the dropshot. Using his long strides, Cilic reached the ball and put it away for a forehand winner. Shortly after, Devvarman terminated the set with a double fault.